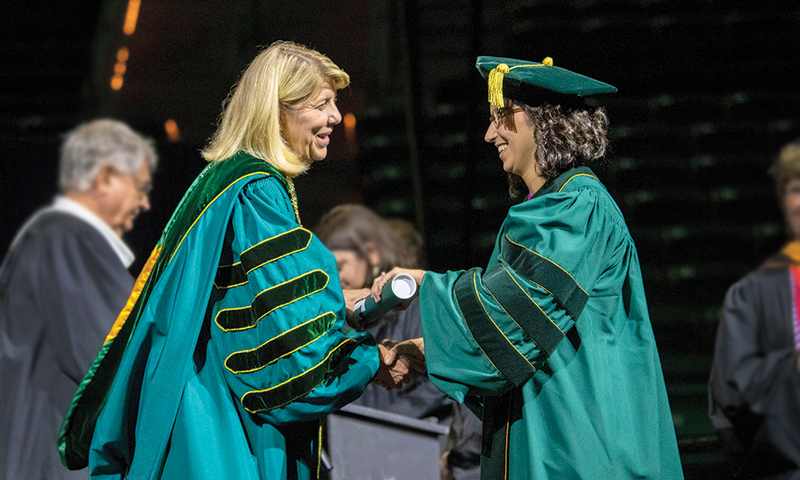 In August of 2018, Savanah Landerholm became the first graduate of the School of Education's PhD in Higher Education Studies & Leadership (HESL). "I thought I might be the last, after two pregnancies and one birth," she said. "But it ended up benefitting me, because I had to manage my time well and have clear boundaries." Landerholm was part of the initial cohort of three PhD students in the Department of Educational Leadership, starting in August of 2014. "Because we were a new program, the professors were very intentional to seek our feedback and work alongside us," she said. "We would call ourselves 'guinea pigs,' and the professors would say 'pioneers.' And I do feel like we have forged a path for a valuable program." A total of 15 students are currently enrolled in the PhD program. "It's an intentionally small program," said Dr. Nathan Alleman, associate professor, who teaches several courses in the sequence. All the students are full time and fully funded; we want them to have an immersive educational experience. Program director Dr. Perry Glanzer, professor of educational foundations, said the Baylor PhD is unique. There is no other program in the nation that does what we do,' he said. "We are a residential PhD program at a Christian university whose focus is preparing Christian educational leaders for both secular and Christian contexts. Glanzer said that the Baylor program focuses on the "moral and ethical questions" in higher-education leadership. "We are unique in that aspect," he said. "Other programs emphasize number crunching and statistics, and we do that as well. But we focus on the philosophy, ethics, sociology, policy and politics also. It's higher education through the lens of the liberal arts." The funding for each PhD student includes a 20-hour per week apprenticeship, giving them practical experience alongside their academic efforts. 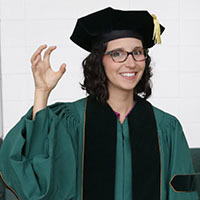 Students work in Baylor departments such as University Libraries, Student Affairs, the Graduate School, the Title IX Office, the School of Education, and Student Success. The program also has partnerships for apprenticeships with the University of Mary Hardin Baylor, McLennan Community College, and Texas State Technical College. Most students also take advantage of the many teaching opportunities. "About 75 percent of students hope to go into higher-education administration, and about 25 percent are interested in tenure-track faculty roles," Glanzer said. The program is attracting high-quality students. In the last two years, two entering students have been awarded as Presidential Scholars by the Graduate School, earning them extra funding. "It's a reflection of the competitiveness of the students," Alleman said. This year, first-year student Zach Mills earned the highly competitive award based on academic merit and overall achievement. Mills said he looked at a number of PhD programs but only applied at Baylor. "I knew Baylor's program was the only one that could offer a university that is committedly Christian and also a high research institution," he said. Mills worked for several years in student life programs for the Council for Christian Colleges and Universities in Washington, D.C., and said he wanted to pursue a PhD because leaders in higher education administration hit a professional ceiling without it. Having earned a bachelor's degree at a small Christian college and a master's degree at a large state university, he wanted to study Christian higher education specifically. "Here, I can hone my skills &mdash; like in any program &mdash; but the professors also understand the context," he said. "And I appreciate the community here &mdash; the holistic care for people and the faith commitment." Students are also attracted because the program encourages them to find their own research interests, rather than tagging along with the established research agenda of a faculty member, Alleman said. He and student Cara Cliburn Allen developed an interest in food insecurity on college campuses. In addition to scholarly publications, their work led to the establishment of the Baylor Free Farmers Market and other resources for Baylor students. During the summer, Glanzer worked with students to develop a research article based on interviews with Christians serving as student-life vice presidents at universities. "The students will be the first authors on it," Glanzer said. "Rarely do graduate students get this kind of mentorship outside of the dissertation." Alleman worked with Landerholm in developing her dissertation topic about women leaders. She interviewed 41 women who were senior university leaders across defined institutional cultural types. Landerholm said her own experience of starting a family while working in higher education sparked an interest in women leaders. "I'm the only student in the program who is a woman with children," she said. "I realized how much I was affected by it even at the small scale as a student." Landerholm was expecting her second child when she graduated in August.